Rogue River Electric Company #2 | Historic Jacksonville, Inc. The Charles R. Ray Electric Substation at 225 E. California Street is located on an historic parcel of land that once was part of Jacksonville’s Main Street. 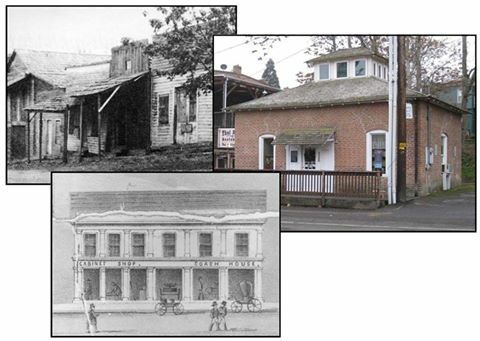 The original wooden buildings subsequently became Jacksonville’s Chinatown, the oldest Chinatown in Oregon. Although the Chinese were greatly discriminated against and denied property rites, this site was conveyed to Lin Chow in 1859 and later to Leong Chow in 1872. In 1888, a fire originating n David Linn’s furniture factory across the street destroyed the entire block. The lot sat vacant until 1905 when the present brick building was constructed as the substation that brought electricity to Jacksonville.